Manoir de Rétival price per day from € 280 . Chambres d'Hôtes Arch'Angels Home price per day from € 120 Arch’Angels Home is a 17th-century house situated in the village of Arques-la-Bataille, 6 Rooms have simple, individual decoration and each has a fireplace and views of the garden. Brunch, lunch and evening meals are available on request and are cooked with fruit and vegetables from the garden and local products from the market.. Le Clos Saint Paul price per day from € 120 . La Roseraie price per day from € 80 . Chambres d'Hôtes La Chatellenie . Gîtes la Conterie price per day from € 60 . Manoir de Rétival price per day from € 150 . 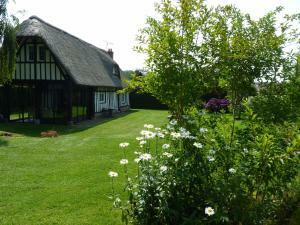 La Charretterie Located in Omonville, just 3 km from Bacqueville-en-Caux, La Charretterie is a self-catering thatched cottage surrounded by a 1000 m² garden. You can relax on the furnished terrace, us the free Wi-Fi and organise barbecues. This thatched cottage also comes with an equipped kitchen. Le Vieux Carré price per day from € 68 . Kyriad Le Havre Montivilliers price per day from € 47 This hotel is set in Montivilliers, just 2 5 km from the city centre. 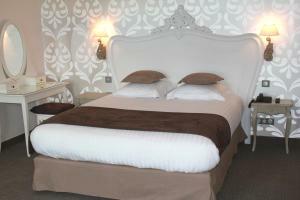 All guest rooms at Kyriad Le Havre Montivilliers include flat-screen TVs with satellite channels. A buffet-style breakfast is served every morning in the hotel's breakfast room, and evening meals are proposed in the restaurant..
Chambres d'Hôtes les Charmettes price per day from € 130 Chambres d’Hôtes les Charmettes is set in a 19th-century manor house just a 10-minute walk from Etretat’s famous cliffs and 700 metres from the beach. Each individually decorated room includes a seating space with a desk and has a private bathroom with a bathtub. Manoir de Bray price per day from € 115 . Le Clos De La Vaupalière price per day from € 59 .